Sagittarius is the sign of the big picture, in Sagittarius we find the world laid out before us ready to be explored. And there is nothing more exciting to a Sagittarius than the prospect of getting on the road and learning all there is to know about the world. Sagittarius is always ready for an impromptu trip. Look in any Sagittarian’s closet and you are sure to find a pre-packed carry-on bag and a valid passport, all the essentials for a quick getaway. Freedom to move, freedom to think their own thoughts and freedom to explore. They chafe at anything that puts the kibosh on that freedom. This includes marriage. Many Sagittarians never marry, it’s too suffocating for them. There are exceptions to this, but rest assured that if they are in a relationship, it’s one that gives them the freedom they need to travel the highways and the by-ways of life. Next to freedom on the list of Sag must haves is truth. They are truth tellers, filters be dammed! They are notorious for ‘saying it as it is’. Also known as foot in mouth disease, they can’t seem to help themselves. Blunt is often used to describe their manner, yet it’s important to note that they do this without guile. It’s just the way they are. 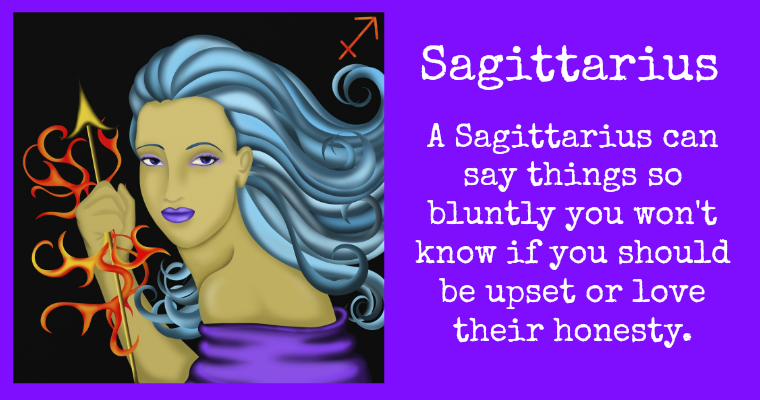 One danger with Sagittarius is they can be the ‘know it all’. This is one of the less enchanting qualities of Sag, yet if you really listen, you will be surprised just how much they do know. It’s only really a problem when they are unwilling to be open to the ideas and opinions of others. When it’s only their opinion that counts you know you are dealing with a less ‘evolved’ Sagittarian. Yet despite their need for ultimate freedom, their propensity to have opinions whether you asked or not, and the no hold bars delivery of said opinions, life with a Sag can be fun. They are smart, funny, talented, broad-minded and inclusive. They are jovial and generous and their perspectives, invaluable. They are the storytellers of the zodiac and their adventures the stuff of legends, and if they aren‘t they aren‘t afraid to embellish a story for the sake of its entertainment value. So get ready for the road trip of your life, when you have a Sagittarian in your life.